Increasingly stiffer competition, not the least of which comes from low-cost countries, is accelerating the pace of automation use by stampers within the European metalforming industry. Case in point: Danish firm C&K Johansen, a specialist in deep drawing that produces a large variety of different parts in small and medium sizes for numerous customers, often on short notice. This requires flexibility—noted by company executives as a crucially decisive factor of success. The firm processes mild and stainless steel sheet from 0.4 to 20 mm thick. “The faster we can reset presses one product to another, the less the size of the batch matters,” says C&K Johansen’s director Peter Moller. 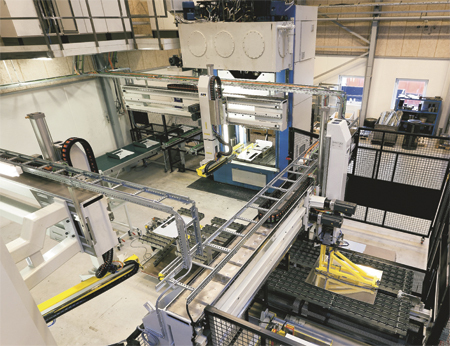 In 2008, right in the middle of the recession, C&K Johansen decided to develop a solution (with hydraulic press and automation supplier AP&T) that would significantly improve the flexibility and efficiency of one of its production lines. The new equipment was in place and work was completed in January 2011. Two existing hydraulic presses, which had up to that point been run manually, formed the point of departure—one a 562 U.S. ton press, the other a 1125-ton model. Both presses are now fully automated and can be used separately or together. Each press can perform one or more operations depending on the type of part to be produced, and they have been modified for quick tool changes. The blank feeder used for the presses can cope with sheetmetal as large as 59 by 59 in., to –0.39 in. thick, a feature that C&K Johansen says is unique to the Danish market. What has really kicked flexibility up a notch, however, are the four-axis AP&T SpeedFeeder press robots used to move blanks and parts to and from the presses. “Using SpeedFeeders with four axes results in virtually unlimited flexibility,” says Moller. “Not only can they move forward, backward, downward and to the side, they also can spin around.” Each SpeedFeeder has lifting capacity to 220 lb., and all of the operations in the production process, from blank feeding and lubrication to finished pressed product, are quick and efficient, an important prerequisite for a high level of productivity.